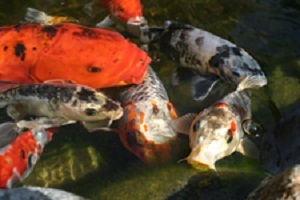 There are several things to talk about when it comes to feeding fish. Fish are cold-blooded. That means that the temperature of the water affects them greatly! Their metabolism will slow down or speed up depending on the water temperature. Ideally, fish thrive when the water is between 68 and 75 degrees. The water temperature will fluctuate with weather, but remember, just because it is a certain temperature outside, doesn't mean the water is the same temperature! Use a thermometer! When the water is below 50 degrees, their metabolism slows down. They are unable to digest food once the water level gets lower than 50 degrees. You will notice that they go to the bottom of the pond and sit still. The bottom of the pond is warmer than the top of the pond in the winter. When the water is warm, above 70 degrees, they benefit from more protein in their food. It helps them put on weight and muscle. Protein rich food will also help them store up for the winter and brings out their vibrant colors. If the water gets above 90 degrees, you will notice the fish remaining at the bottom of the pond where, in the summer, it is cooler. Feeding them when it is this hot is not be a good idea. Do what you can to not let the water get above 90 degrees. If you have to string up some shade cloth during a long heat wave, then do it! Remember that smaller or more shallow ponds heat up more quickly. Hot water hold less oxygen than cold water. If it gets really hot, add an aerator! Koi will each both plants, bugs and other fish. Both of these types of foods help keep them healthy. Feeding your fish a few frozen peas or leaf of lettuce is good for them too! They will eat blueberries, nibble on zucchini, and other vegetables. Cheerios are not something we need to be feeding our fish. They are junk food for fish. Cheerios don't contain the proper protein and fat for fish. So save the cheerios for the family! Make sure to store your fish food in an air tight container in a cool place. Storing fish food in the heat can cause to it go rancid! Feeding fish only what they can consume in 5 minutes helps keep them healthy. Fish do not have stomachs like we do. They have a straight digestive tract. It takes roughly 4 hours for them to digest food. They will likely keep eating if you feed them past 10 minutes, but it overloads their digestive tract, causing them to poop it out before it is properly digested. If there is food floating after 5 minutes, simply use a net to pick up the uneaten food out of the water. Ever wonder how much to feed them? A tablespoon or a cup? Stay away from flake food in the pond. Stick to pellets. They actually come in sizes based on the size of your fish. The bigger, the fish, the bigger pellet they can eat and the more they can eat. Unless you have a very big pond with hundreds of fish, think table spoons rather than cups! Rather than calculating fish in inches or in pounds and finding 3% of their volume etc......just take into account how many fish you have and how large they are. Then find out how much they can easily eat in 5 minutes. Then stop feeding them. If your pond has some algae (not way too much), and has plants, feeding them once a week is plenty. If you really LOVE feeding your fish you can feed them everyday. However, remember that the more you feed them, the more they poop, the more they poop the more work the filter has to do. If the filter can't keep up, the algae will sue the nutrients of the fish poop to flourish! One of the first pieces of advise we give to clients to with algae problems is to cut back on feeding the fish. Be sure not to over feed your fish. It can cause them to bloat up. If they can't digest the great quantity of food, they will get very fat and be susceptible to disease.